Strong Streams start with strong stormwater infrastructure. Storm drains lead directly to streams and rivers. 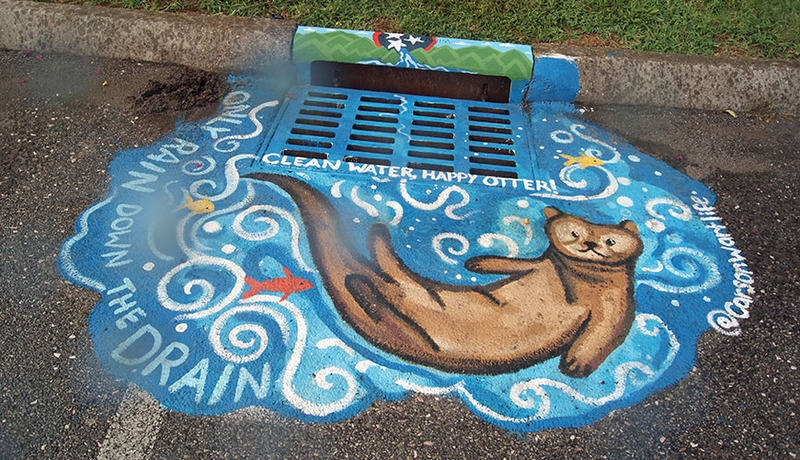 The Storm Drain Art initiative aims to raise awareness about this fact by turning everyday storm drains into beautiful works of art! The Storm Drain Style-off is a public education project designed to inform the community of the connection the storm drains have with our rivers and streams. In 2017 and 2018, Knox County Stormwater partnered with the Public Libraries to educate our citizens about stormwater. Artists painted designs and messages at storm drains in an effort to prevent people from dumping and littering. Check out the buttons below labeled “SDSO 2017 Murals” and “SDSO 2018 Murals” to see the beautiful works of art at libraries across the county. Also, you can visit https://www.facebook.com/strongstreams/posts/10157273031863094 to see pictures from the 2018 SDSO Celebration Event! In Knox County, as in many communities across the country, storm drains lead directly to our rivers and other surface waters. An ongoing and hazardous misconception is that the storm drains are “sewers” that lead to the wastewater treatment plant. With this misconception, the storm drains are misused as a safe way to dispose of waste such as soapy water, oil, paint, trash, and other pollutants. When pollutants are disposed of through storm drains, they end up in our waterways. Storm drain art initiatives have been successful in other communities at raising awareness about the fact that storm drains lead directly to local waterways. This awareness reduces incidences of littering and other common water polluting activities, and reminds people that only rain should go into the storm drains. Sign up for our Quarterly E-Newsletter for seasonal stormwater management tips, workshop and event information, and more! Email Stormwater@knoxcounty.org and simply type “Subscribe” into the subject line.